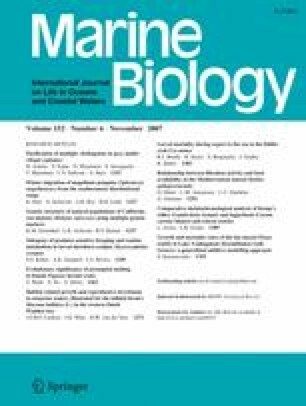 The temporal patterns and the effect of shell size and depth on growth and mortality rates of the endangered fan mussel Pinna nobilis were investigated in the marine Lake Vouliagmeni (Korinthiakos Gulf, Greece). A total of 160 individuals were tagged and monitored monthly for a period of 17 months. At each visit, the size of the tagged individuals (shell width, w) was measured in situ and recorded. Any mortality event was also recorded and attributed to natural causes or (illegal) fishing. Growth and mortality rates were modeled with generalized additive models, which are non-parametric flexible models that free the researcher from the limiting concept of a strict parametric shape. The use of GAMs allowed the exploration of shapes of growth and mortality response curves in relation to predictor variables and allowed the fitting of statistical models that better agree with ecological theory. Growth rates had a seasonal pattern, with an extended period of very slow growth between late autumn and early spring, i.e., during the cold season, another short period of slow growth during August (when water temperatures reached their maximum values exceeding 29°C), and a peak in growth rates during late spring–early summer, probably related to an optimum combination of temperature and food availability. Growth rates varied with shell size, with a peak at w ∼4.5 cm, followed by a sharp decline to an approximately constant level, with sizes ranging from 9 to 15 cm, and a further decline with larger sizes down to almost zero for w > 20 cm. Growth rates did not vary substantially with depth. Although P. nobilis is a protected species in the EU and its fishing is strictly prohibited, fishing mortality was very high in Lake Vouliagmeni (much greater than natural mortality), especially during the hot season when the lake was crowded by summer visitors. The fan mussels were poached exclusively by free-diving and due to the high turbidity of the lake’s water, fishing mortality was higher in shallow areas (and mostly for large individuals) and was practically zero at depths >9 m. Due to fishing mortality, a size segregation of P. nobilis was observed in the lake: large individuals were restricted to deeper areas, while young and small individuals were more abundant in shallow areas where there was preferential recruitment. Natural mortality was strikingly size dependent and P. nobilis suffered high natural mortality during the first year of life; the probability of death by natural causes quickly diminished as the fan mussels grew in size. No depth-related differences in natural mortality were found. I would like to thank two anonymous reviewers for their suggestions and comments, which helped to improve the quality of the manuscript. This work complies with the current laws of Greece and EU.